Great celebrations call for a toast of champagne. Whether it's for an intimate event or a victory party, it's never the same without this sparkling drink. Get the cheapest deals on champagne from Marks & Spencer, Sainsbury, Wowcher, Tesco, ASDA and Morrisons. You can get the best price on Louis Chaurey, Veuve Monsigny, Moët & Chandon, Chambord Royale, Bollinger, and Sainsbury's Blanc De Noirs when you use voucher codes on that next purchase. Special offers are also up for grabs when you meet the minimum amount required. For occasions worth cherishing, champagnes are a must-have. Are you planning getting a bottle of bubbly this weekend? Or are you considering buying one for the coming holidays? Champagne is a type of sparkling wine. It originated from the Champagne region in France and was discovered by a monk named Dom Perignon when he bottled wines that were not fully fermented. This resulted in the corks to pop because of resultant gas trapped as bubbles. Hence paving the way to the birth of a new kind of exciting wine. Champagnes are typically a blend of Chardonnay, Pinot Noir as well as Pinot Meunior. The UK is one of the most prominent market of champagne. You can find a wide array of great options from different producers that will fit any taste and budget. Where Can I Find Cheap Champagne Deals? If you’re looking for cheap champagne deals in the UK, you’ve come to the right place. Here at Latest Deals you will find the best champagne sale and boxed champagne special offers in the UK from online retailers such as Marks & Spencer, Sainsbury's, Morrisons, Lidl, Aldi, ASDA, Tesco and Amazon just to name a few. Our team of money saving experts and community of bargain hunters are always looking out for updated and best champagne deals around. We regularly update our deal page so make sure to grab the offer you’re eyeing right away as they run for a limited time. If you’re looking for great deals on top and best selling champagne brands in the world such as Moet and Chandon, Dom Perignon, Lanson or Pommery, Amazon is the retailer for you. You can even get exclusive discounts and free delivery if you’re an Amazon Prime member. For a wide range of cheap sparkling wine, champagne and Prosecco, ASDA has plenty of special offers including 2 for £9 and at least 20% off on select brands on their rollback deals. SunGlasses Glass of Champagne. 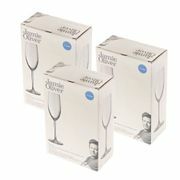 These cute high-quality glasses are are good for parties such as birthdays, wedding or company events. Yankee Candle Large Tumbler Champagne Bubbles. This is a perfect gift for weddings and other occasions or as an addition to your candle collection. Charbonnel Et Walker Pink Marc De Champagne Chocolate Truffles. Eight decadent handmade truffles which come in a lovely box and made from the finest milk chocolate combined with Marc de Champagne. Perfect as a birthday gift for chocolate and champagne lovers. Waitrose Special Reserve Vintage Champagne, Waitrose. Intense, rich and full-bodied as you would expect from a vintage champagne. It is creamy with yeasty notes, soft citrus and ripe berry. R&L Legras Blanc de Blancs, Berry Bros. & Rudd. This chardonnay has delicate pure lemon with a little hint of yeastiness. Tesco Finest* Premier Cru, Tesco. This champagne is great for any occasion and made from grapes that are predominant. Les Pionniers Vintage Champagne 2008, The Co-Operative Food. From Co-op’s own label, this vintage drink is light with 60% blend of pinot noir. Philizot et Fils, Veuve Monsigny Brut NV, Aldi. It mixes pinot noir, chardonnay and pinot meunier for a classic taste with citrus, biscuit, baked apple and cream notes and a subtle marzipan flavour. Deciding which champagne deals or offers to choose can be daunting with so many options and price points to choose from. Champagne do not come cheap and this is the very reason why purchasing it should be taken seriously. Sweetness. Each bottle of wine comes with a sweetness level on their labels such as Demi-Sec, Brut and Extra-Dry. Brut is recommended for beginners, which is a dry champagne with subtle sweetness. Blend. As mentioned earlier, champagne is made from three blends of grapes. If you want something delicate and light, choose a 100% chardonnay or Blanc de Blancs. For a fruity blend, opt for Rosé and Blanc de Noirs for more complex and robust flavours. Retailer. Choose a retailer where they will give you a suggestion of the perfect bottle. There are numerous online retailers where you can find some of the best and rarest wines as well. Champagne is sparkling wine, but not all wine can be considered as champagne. A champagne can only be called that if it comes from the Champagne region in France. Moreover, it can only be produced using three blends of grapes; white, dark and red. It also undergo a two-step fermentation process to produce its bubbles. In terms of cost, a very expensive wine can cost thousands of pounds while a sparkling wine are more affordable and will not break your bank account. This will all boil down to the quality of grapes used to produce the drink.